Chelsea have been given hope of securing the transfer of an ideal potential Eden Hazard replacement in the form of Lyon star Memphis Depay. With the Blues looking increasingly likely to lose Hazard to Real Madrid at the end of the season as he looks no closer to signing a new contract, a new addition in attack looks a must. And now Depay has given Chelsea the ideal opportunity to snap him up to come in on that left-hand side after admitting he wants a move to a bigger club, naming Chelsea but not his former team Manchester United as one of his preferred options. “Lyon is a big club, but not one of the five best in Europe,” Depay said in an interview. Transfermarkt claim Depay’s current market value is around £45million, and while it’s perfectly possible Lyon would ask for more than that, it seems like he could be one of the cheaper options on the market soon. The 24-year-old flopped at Man Utd earlier in his career but has looked like potentially one of the finest forwards in Europe in spells at PSV and Lyon. 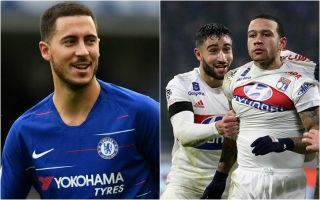 If Chelsea do lose Hazard, Depay for £45m could be a superb replacement – and they’ve now been given a clear message he’d be keen on that move.